The passionate artistry of violinist Linda Melsted has won the hearts of audiences across North America, Europe, and Japan. Currently concertmaster of Seattle Baroque Orchestra, she has appeared with many outstanding ensembles, including Tafelmusik, Portland Baroque Orchestra, Pacific Baroque Orchestra. Linda is the featured soloist in Tafelmusik’s documentary “Le Mozart Noir” and has recorded for Sony, ATMA, Classique, CBC, and Harmonia Mundi. Linda’s true love is chamber music and she has performed with many ensembles in chamber music series from Toronto to Seattle including Early Music Vancouver, Gallery Concerts, Northwest Showcase, Camerata Musica, Folia, Discovery Island Music Festival, La Primavera, and Toronto Music Garden. 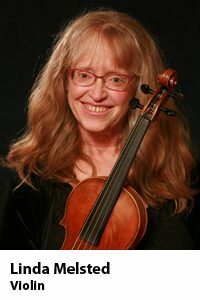 Linda is co-founder of the chamber ensembles La Modestine, based in Vancouver B.C., Leonarda’s Circle in the US, sound|counterpoint in Seattle, and Salish Sea Players, a group dedicated to bringing early music to retirement and nursing facilities in the greater Seattle area. Working with adult amateurs is one of Linda’s favorite activities. She is the director of the New Baroque Orchestra, a community collegium of Early Music Seattle, and is a coach for the Puget Sound Chamber Music Workshop and the Seattle Baroque Flute Workshop. Linda performs on a 1670 Nicolo Amati violin.